If you have children then you know that having a great place for them to sleep is important. But if you have more than one child and not enough rooms in the house it could be a question of just where they are going to sleep at night. A bunk bed can then create a fun and efficient way to get the most out of your space. With any of these, you’re going to have something high quality and fun for your children, but only if you know what you’re looking for. Material: What are the bunk beds actually made of? Is it wood, which is more durable but quite heavy to move around? Is it metal which can be slightly less durable but is definitely easier for you to move whenever you need? Drawers: Are there drawers under the bed? Some beds have them and some don’t, which will likely be a personal preference for you and your child but it definitely can be a convenience. More storage is always a good thing. Access: How will the child sleeping on the top bunk get up there? Is there a full staircase, which you may want with smaller children in the space or is there a small ladder? While a ladder might not be bad for older children it can be scary otherwise. Finish: What does the bed look like? Is it brown, black, gray or some other color entirely? What does the finish actually look like and how is that going to influence whether you like the bed or not? It’s about personal preference. Dimensions: You need to make sure that the beds you buy are going to fit into the space and that’s where the dimensions come in handy. Make sure you’re getting full bunk beds and that you’re going to fit them easily into the room. Warranty: How long is the warranty on the beds? A good warranty will mean that the company stands behind the product and that it should last you an extended period of time. If you don’t get a good warranty it doesn’t say much about what the company believes. With so many different bunk beds out there and your children looking for somewhere comfortable to rest it can be difficult to find just what you need, but it’s definitely possible. Take a look at our bunk bed review guide and see which of these bunk beds just might be the ideal option for you and your family. You may be surprised at what you find. 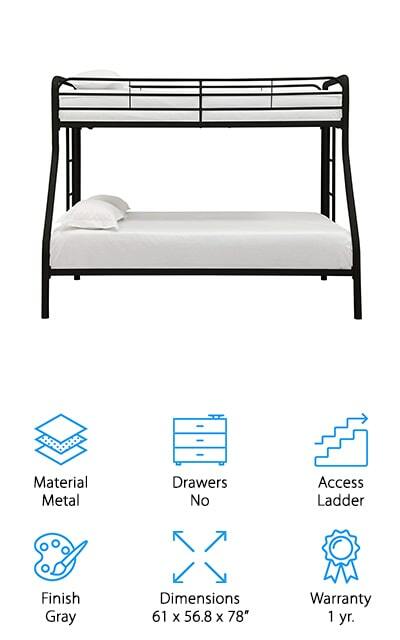 Our top pick is a sleek and unique choice for a metal bunk bed. It has a gunmetal finish that makes it look very high class and has a ladder on each side, so it works no matter how you set up your room. There is assembly needed to get it ready to go, but you can also hire someone to assemble it for you if you prefer. The two full sized bunk beds mean that just about any child will be comfortable sleeping here, and there won’t be any fights over who gets the larger bed. 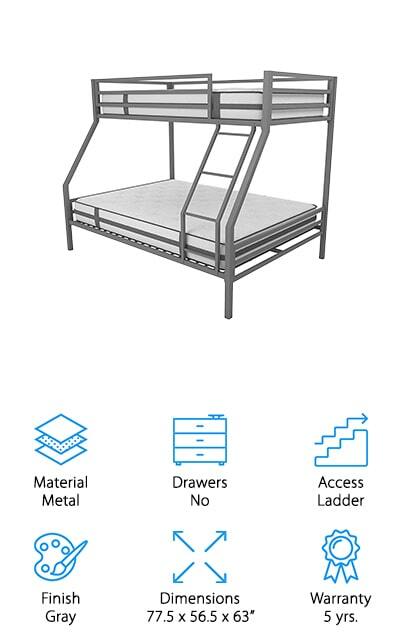 Made with 2” metal tubing, the bunk bed system is a moderate weight and should be easy for you to get into the right spot and set up for anything. It has a 1 year warranty against damages so you can feel comfortable using it for your family. With this bunk bed, you’re going to get one smaller bed on the top and one larger one on the bottom. The top gives you a twin while the bottom is full size, so it’s great for different aged children and also provides a larger section to sit on with the bottom bed. 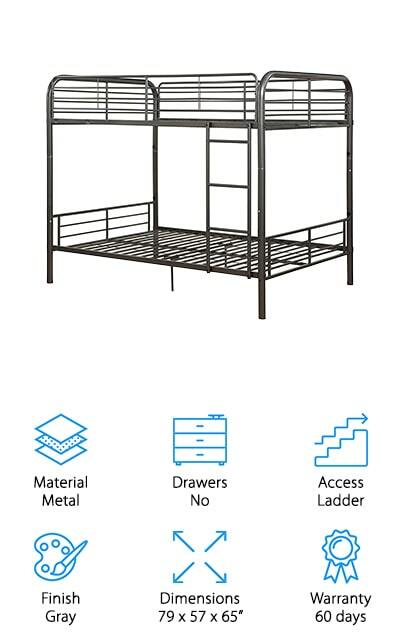 The ladders on each side mean that you can set up this bed however you want and still have access to the top, plus you get plenty of durability and safety with the guardrails on the top bunk. The top bed can support up to 200 pounds and the bottom can support up to 450 pounds, which means it could be a great place for your kids to hang out and watch movies or just sit around together. You’ll also have no problem getting it all assembled properly and ready to use. 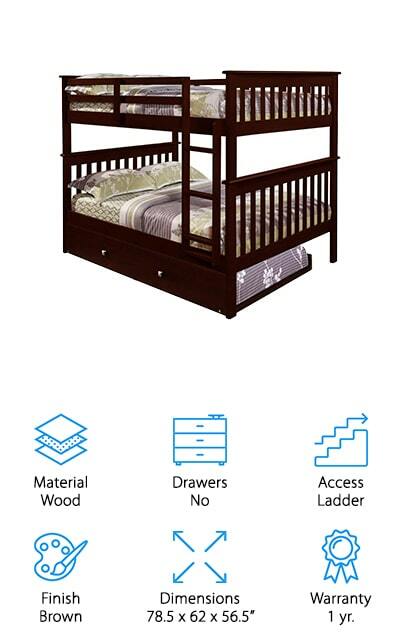 This sturdy bunk bed gives you plenty of durability and safety. It offers a guardrail all the way around the top bunk to protect whoever is sleeping there and gives you 2 full size beds, one over the other. 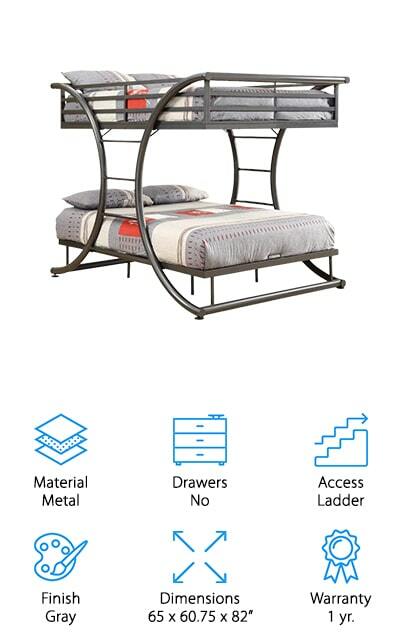 Made with a durable but lightweight metal, these beds come in both a gunmetal and dark brown option and give you an inexpensive way to save some space in your child’s room. There is a ladder on one side and support beams all the way around the beds to make sure that both of them are secure. If you decide that you want to have separate beds for each of your kids these beds can even be separated to give you 2 individual beds. With a reversible ladder to set up however you like, it’s definitely going to be comfortable for your kids. 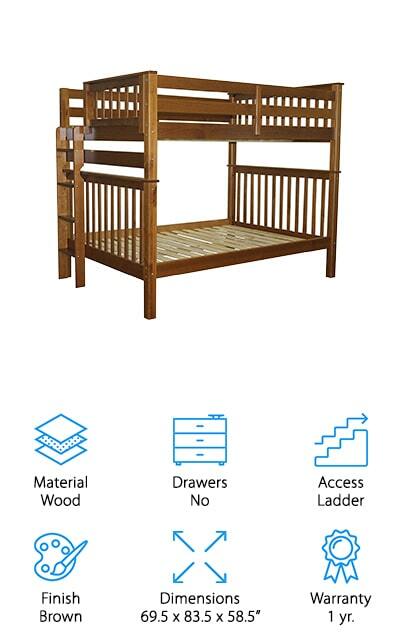 You always want to make sure you have a quality bunk bed for your children and this is definitely going to give you just that. The bottom bunk is a full size, which gives your child more space and also a place to sit without having to worry about hitting their head. On top is a twin size bed with a full guardrail all the way around. Available in gray, navy blue and pink, this bed can also be found in a double twin version, so both the top and bottom bunk are twin size. The ladder is attached to the beds and is raised from the floor as well. The 5 year warranty is definitely something that you can rely on and you’ll have no problem getting the bed ready to go when it arrives at your house. Plus your kids are going to have a great time sleeping in here. If you’re looking for plenty of space for your children and maybe a guest to spend the night then this fun bunk bed might be just what you need. The beds themselves are made entirely out of wood so you know that they’re durable and they’re also going to look great. There’s a ladder to get up to the top bunk, which also features guardrails to protect whoever is sleeping up there. What’s really unique about this bed, however, is that there is actually a trundle bed underneath that looks like a set of drawers, until you pull it out. The two upper beds can be separated out to get independent beds and give you full size options. 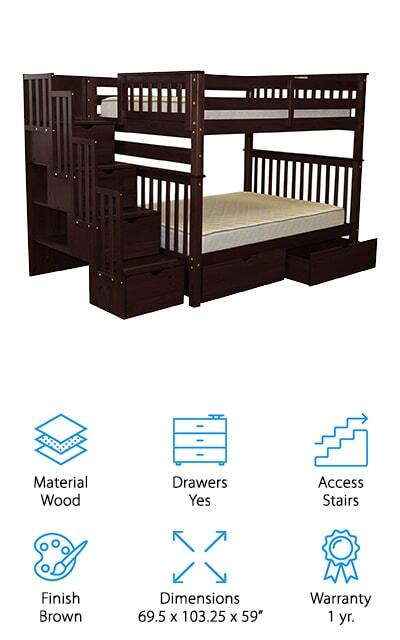 The twin size trundle underneath makes for a great place for a sleepover and all of the pieces meet or exceed ASTM and CPSC safety standards. You want the best bunk bed for your child and this just might be it with all the features and the quality that you’re going to get. Here you’re going to get 2 full size beds, which means no fighting over who gets the top or who gets the bigger bed, everything is the same. There are also guardrails all the way around the top bunk and you’ll get an actual set of stairs instead of a ladder, making it safer to climb to the top. There are guardrails down the side of the stairs and there are plenty of drawers all over this bed, giving you even more storage space. Under the bed are two drawers and each of the steps offers more space to store anything you might need. Made entirely of solid Brazilian pine, these beds are secure and they’re going to look great in your child’s room. You don’t just want any cheap bunk beds. You want something that’s going to look great and keep your kids happy as well. This option gives you a twin size bed over a full size bed and can be converted into 2 standalone beds as well. 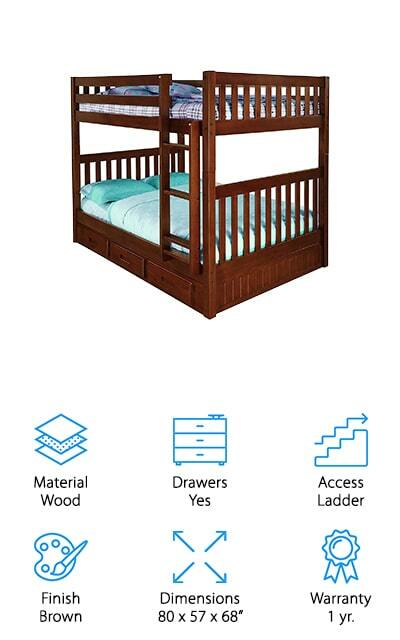 You install the ladder onto the front of the bed to get easy access and you get to choose between 5 different color options to match your child’s preference and their room. Made with a secure wood design, there’s no need for box springs with these beds. You’ll have a 1 year warranty that says everything about this bed is high quality and you don’t have to worry about anything. That’s definitely important when you’re trusting it with your children. Even better, it’s a great size to fit everyone and keep the room feeling spacious. You want the best bunk bed for your child, and here you’re going to be getting just that. This bed is designed with a full over full setup so your kids get the same amount of space. It also has a built in ladder that makes it easy to get from the bottom up to the top bunk and has guardrails all the way around for safety. Under the bed are drawers that help maximize the space and keep all of your child’s belongings right where they need them to be. The solid wood construction means that these beds are durable and you can even separate them out into individual beds as your children get older. You won’t have any reason to use a box spring because of the slats under the bed as well. The sleek and simple design of this bed makes it a great choice for your child, no matter their age. It’s available in white, cappuccino or a natural wood tone and gives you 2 full size beds with an attached ladder. Made with completely natural and solid wood you know you’re getting something durable and long lasting. 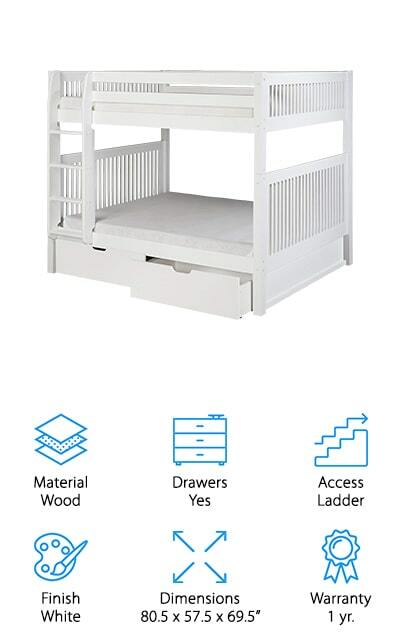 On top of that, you get extra-wide and deep grooved steps that will help improve safety as your child is climbing and a guardrail around the top for while they are sleeping. Under the bed are even drawers to help store your children’s favorite things, some clothes or anything else you might need. Along with everything else you’re also going to get a 1 year warranty that says this bed is durable and made to last. 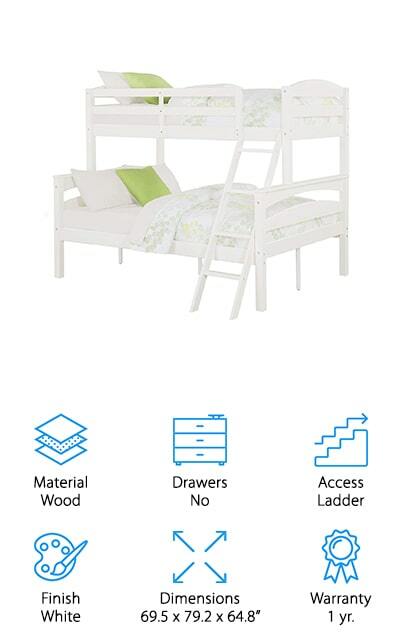 This bunk bed set may look simple but it’s definitely going to get you everything you and your child need. It has 2 full size beds and a ladder at the end, which keeps it out of the way of whoever is sleeping on the bottom bunk. Available in an espresso color, the bed itself is actually made with solid Brazilian pine, to increase the durability and the longevity of the bed. You’ll have plenty of space to sleep and you don’t need extra tools to get it setup, everything is included. All you’re going to need are a couple mattresses and your kids are going to be climbing onto this bed in no time at all. There’s no need even for a box spring because you’re getting plenty of support already built in.